Kerala University has published the third allotment list of degree admission 2014. The allotment list for various first degree programs in the affiliated colleges for the academic year 2014-15 is now available at the University website. Those who have applied for courses under the University can check their allotment status from the web portal www.admissions.keralauniversity.ac.in, using their application number and password. Candidates those who couldn't find their names in the first and second allotment but made into the third list can login to the University admission website to check their allotment status. Such students should have to download the admission fee remittance chalan and pay the admission fee in any SBT branch. The admission fee for general category is fixed at Rs 1360 and for SC/ST category Rs 600. After remitting the fee, applicants are directed to login to the website and enter the details of admission fee remittance before the stipulated time. To confirm their seat and to avoid chaos in the later stage, students should take care in arranging the online and offline process. The allotment of those candidates will be cancelled and will not be considered for future allotments, if so they fail to enter admission fee details on time. If not satisfied with the current allotment, applicants can cancel it by logging in to the website. If the higher options are no cancelled before 28th June 2014, it will be considered for future allotments and the candidates should have to take newly allotted seat. Those who got allotment in the first and second phase can download the allotment Memo from 23rd June. Details including allotted college, course, category, admission date would be printed in the allotment Memo. It is very important to keep in touch with the prominent dailies and official portal of the University to get updated information about the allotment process. 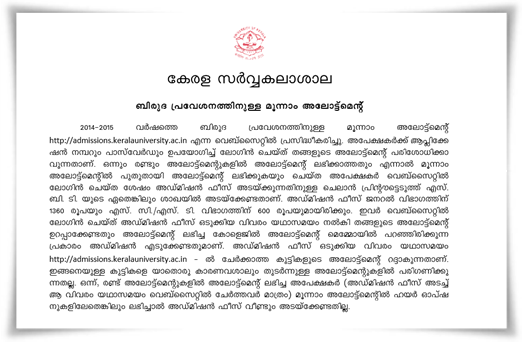 For more details about the 2014 allotment procedure visit the official admission web portal of Kerala University. Kerala University degree first allotment 2014 has been published in http://admissions.keralauniversity.ac.in, the admission website. Applicants can check their allotment after logging into the site using their application number and password. Those who got allotment should download the admission fee remittance chalan and remit the admission fee in any SBT branch. Read more to know about the Kerala University degree first allotment 2014. Kerala University degree admission 2014 second allotment result has been published. The second allotment list for various first degree programs in the affiliated colleges under University of Kerala for the academic year 2014-15 has been published in the admission website. Students who have submitted the applications can check their allotment status after logging into the site http://admissions.keralauniversity.ac.in, using application number and password.